Inscription: 1997 Mount Vesuvius, a volcano near the Bay of Naples in Italy, is hundreds of thousands of years old and has erupted more than 50 times. Its most famous eruption took place in the year 79 A.D., when the volcano buried the ancient Roman city of Pompeii under a thick carpet of volcanic ash. The dust “poured across the land” like a flood, one witness wrote, and shrouded the city in “ darkness…like the black of closed and unlighted rooms.” Two thousand people died, and the city was abandoned for almost as many years. When a group of explorers rediscovered the site in 1748, they were surprised to find that–underneath a thick layer of dust and debris–Pompeii was mostly intact. The buildings, artifacts and skeletons left behind in the buried city have taught us a great deal about everyday life in the ancient world. Ever since the ancient Greeks settled in the area in the 8th century B.C., the region around Mount Vesuvius and the Bay of Naples attracted wealthy vacationers who wanted to soak up the sun and the scenery. 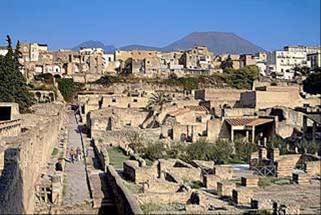 By the turn of the first century A.D., the town of Pompeii, located about five miles from the mountain, was a flourishing resort for Rome’s most distinguished citizens. Elegant houses and luxurious villas lined the paved streets. Tourists, townspeople and slaves bustled in and out of small factories and artisans’ shops, taverns and cafes, and brothels and bathhouses. People gathered in the 20,000-seat arena and lounged in the open-air squares and marketplaces. On the eve of that fateful eruption in 79 A.D., scholars estimate that there were about 20,000 people living in Pompeii and the surrounding region. Mount Vesuvius has not erupted since 1944, but it is still one of the most dangerous volcanoes in the world. Experts believe that another Plinean eruption is due any day--an almost unfathomable catastrophe, since almost 3 million people live within 20 miles of the volcano’s crater. The Vesuvius volcano did not form overnight, of course. In fact, scholars say that the mountain is hundreds of thousands of years old and had been erupting for generations. In about 1780 B.C., for example, an unusually violent eruption (known today as the “Avellino eruption”) shot millions of tons of superheated lava, ash and rocks about 22 miles into the sky. That prehistoric catastrophe destroyed almost every village, house and farm within 15 miles of the mountain. But it was easy to overlook the mountain’s bad temper in such a pleasant, sunny spot. Even after a massive earthquake struck the Campania region in 63 A.D.–a quake that, scientists now understand, offered a warning rumble of the disaster to come–people still flocked to the shores of the Bay of Naples. 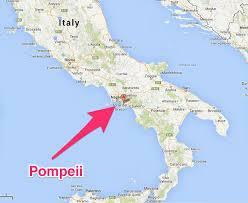 Pompeii grew more crowded every year. As it cooled, this tower of debris drifted to earth: first the fine-grained ash, then the lightweight chunks of pumice and other rocks. It was terrifying–“I believed I was perishing with the world,” Pliny wrote, “and the world with me”–but not yet lethal: Most Pompeiians had plenty of time to flee. For those who stayed behind, however, conditions soon grew worse. As more and more ash fell, it clogged the air, making it difficult to breathe. Buildings collapsed. Then, a “pyroclastic surge”–a 100-miles-per-hour surge of superheated poison gas and pulverized rock–poured down the side of the mountain and swallowed everything and everyone in its path. 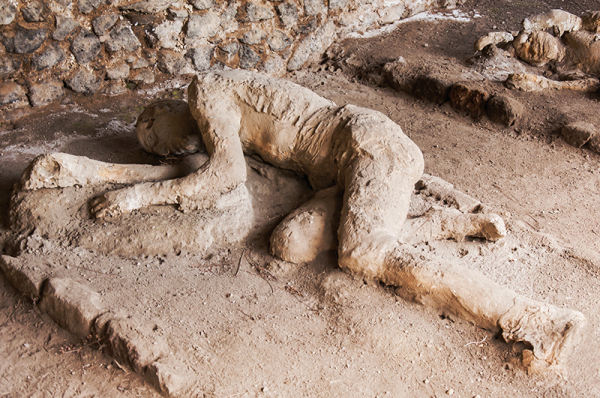 By the time the Vesuvius eruption sputtered to an end the next day, Pompeii was buried under millions of tons of volcanic ash. About 2,000 people were dead. Some people drifted back to town in search of lost relatives or belongings, but there was not much left to find. 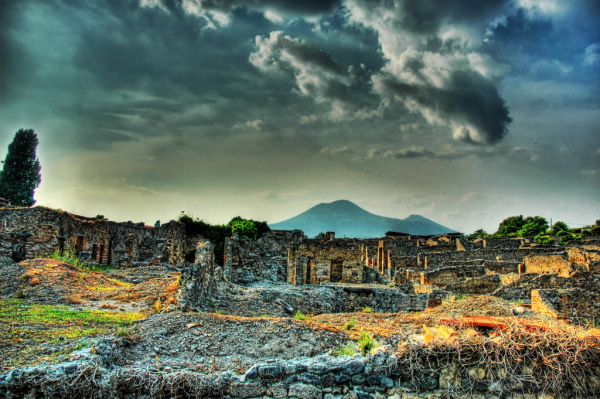 Pompeii, along with the smaller neighboring towns of Stabiae and Herculaneum, was abandoned for centuries. Pompeii remained mostly untouched until 1748, when a group of explorers looking for ancient artifacts arrived in Campania and began to dig. They found that the ashes had acted as a marvelous preservative: Underneath all that dust, Pompeii was almost exactly as it had been 2,000 years before. Its buildings were intact. Skeletons were frozen right where they’d fallen. Everyday objects and household goods littered the streets. Later archaeologists even uncovered jars of preserved fruit and loaves of bread! Many scholars say that the excavation of Pompeii played a major role in the neo-Classical revival of the 18th century. Europe’s wealthiest and most fashionable families displayed art and reproductions of objects from the ruins, and drawings of Pompeii’s buildings helped shape the architectural trends of the era. For example, wealthy British families often built “Etruscan rooms” that mimicked those in Pompeiian villas. Today, the excavation of Pompeii has been going on for almost three centuries, and scholars and tourists remain just as fascinated by the city’s eerie ruins as they were in the 18th century.